Heartburn that doesn’t get better can be a sign of something more serious. Heartburn is a very common condition that affects about 42 percent of Americans. In fact, I experienced it myself shortly after dinner last night. It is a symptom of gastroesophageal reflux that you typically feel as pain or burning in the chest. When you have heartburn, some of the acid in your stomach comes up into your esophagus, causing that pain. Taking an over-the-counter antacid can bring relief in moments. Chest pain, however, is also a common sign of heart disease. Heart disease is life-threatening and is diagnosed in about 12 percent of Americans (according to the Centers for Disease Control and Prevention). It is one of the top causes of death for Americans. A heart attack, a condition in which the heart muscle is deprived of oxygen because of blocked blood vessels, can strike suddenly and be fatal if not treated promptly. 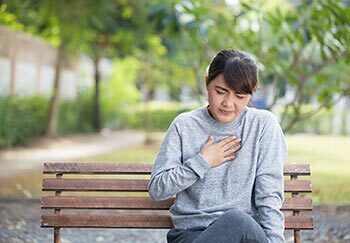 If you’re experiencing pain or burning in your chest, how do you know it’s just heartburn and not something more? We spoke with a pair of UVA doctors for some clarity. Be mindful of when symptoms occur and what other activities you were engaged in at the time. “The symptoms of reflux usually occur after a meal, in particular, acidic meals or greasy meals. Sometimes chocolate or wine can cause it,” says Brandy Patterson, MD, a member of UVA’s heart and vascular team. “But chest pain or burning that occurs with or just after exercise or exertion, and has nothing to do with a meal, is more concerning for a problem with the heart. If you’re in that situation, the best thing to do is stop exerting yourself, sit down and rest and, if it doesn’t go away, call 911 if it’s severe or call your doctor if it’s not,” advises Patterson. Differentiating simple heartburn from heart disease symptoms can be challenging. “Sometimes, people may have a meal and then go out for a walk. In that situation, it can be difficult to tell the difference between reflux or heart disease,” says Patterson. In addition to the time of occurrence and related activity, understanding your own potential risk factors for heart disease is also helpful. “Age is an important risk factor for both men and women. A man’s chance of a heart attack increases at around age 40. However, the increased risk occurs around menopause for women. “Other factors include gender and family history of premature coronary artery disease. These factors are not in our control, but there are many more controllable risk factors,” reminds Patterson. But what about the pounding chest pain and collapse we’ve all seen in countless movies and TV shows? Isn’t that how heart attacks are supposed to happen? In particular, gender may have an impact on potential heart attack symptoms. “Women tend to not have the typical heart attack symptoms. It can present as something that feels like heartburn,” states Sauer. Find a primary care provider to answer your questions. If you’re concerned that the burning in your chest is more than an antacid can handle, don’t hesitate to see your doctor. “If you’ve never had heartburn and you’re older, seeing your primary care doctor is the right thing to do,” says Sauer. If you have taken antacids for what you believe is reflux and the reflux is not going away, “It’s really a no-brainer to make sure it’s not the heart first,” advises Patterson. Heart disease is the number one cause of death in the United States. And the best treatment? Prevention. But heart disease prevention works best when you and your doctor share the responsibility. My mother thought she had an ulcer because she had epigastric pain after eating. She went to a GI doctor who ran tests and found gallstones and scheduled her to have it removed. 3 days before the scheduled surgery she ended up in the ED with N&V and they thought it was an acute GB attack. All the time she was having angina and had a massive MI caused by a proximal LAD lesion. She couldn’t do much after that although she lived (barely) for 4 more years. The cardiologist told us she had been experiencing angina. He explained that eating causes the gut to work harder and in response, the heart to work harder. He said people often think they’re experiencing heartburn when it’s really angina. I always think it’s best to get the worst ruled out. I was having extreme burning and pain in my chest that went down through my arms gave me a severe headache along with shortness of breath feeling sick to my stomach sometimes like I was going to throw up burning hot feeling like I was going to pass out and had to lay down even then the extreme pain felt like burning pins around my chest stomach and body the pain was so severe. I don’t know if this was a heart attack or not I had not eaten two times when it happened only once that was the last time. Right now I have pain in my chest and my breath is short but I don’t know what is going on going on . I have had two stents put in but I don’t understand what my pain has been. Mary, we can’t give medical advice on the blog, but we recommend that you go to the nearest emergency room or speak to a doctor immediately.